Cheap and easy landscape edging ideas that are practical and look good are not that easy to come by. In fact, it's one of the more difficult landscaping decisions that people can face. So before we get into talking about ideas, let's cover a few important things first. Think about buying a piece of art. Many people don't consider the value of a good frame that will protect and compliment the work. A poor choice of frame can affect the appearance and value of the work in a negative way. The same thing can happen with your landscaping. Unfortunately landscape and garden edging is never given the consideration it should when determining your budget in the early stages of design. It can end up being an after thought. Most people tend to spend their time and money on the actual features in the yard and not how to finish them off. 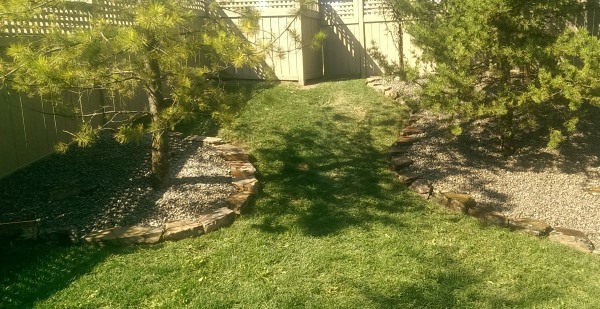 Landscape edging ideas like this rock border are easy to install. They also can look good with almost anything, but the price varies substantially depending on where you live. In the end they find themselves installing cheap landscape edging just to get the job done. You wouldn't use a $2 frame for a Rembrandt would you? That doesn't mean to say that there aren't cheap and easy landscape ideas out there that look like great and don't cost a fortune. Not every piece of art needs a frame and not every yard needs edging, so make the decision in your design stage to determine if you'll need edging or not. Once you have determined this, what do you install? It should be practical, look good, compliment the features in your yard, and not break the budget. 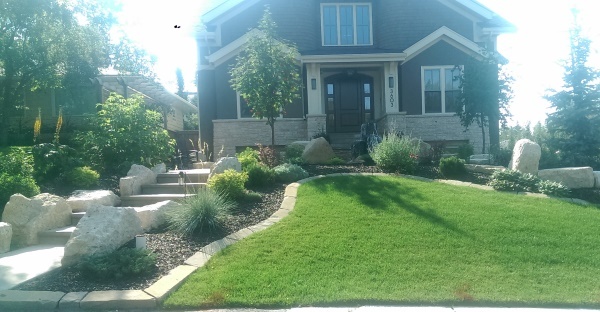 Plastic edging is an easy and affordable way to separate grass from decorative rock beds. Landscape edging can be made out of anything. Bricks, blocks, rocks, wood, plastic, rubber, steel and even glass bottles. You'll have a few decisions to make like, what will be the most practical material for you if you have children or pets and what will be the easiest to mow over, around, or against? The lines of your edging should be mower friendly without any unnecessary or abrupt changes. Try not to leave awkward angles, thin strips of lawn, or reverse angles that you can't access with a mower. (I see this quit frequently with garden beds and fence lines.) Make the lines smooth flowing, gradual, and easy to follow with a mower. The two words that are handy to remember with any aspect of landscaping are practical and functional. Mow over edging is a great way to border garden beds. These edges are easy to maintain while keeping clean lines. So where do you get good landscape edging ideas? We recommend driving around to check out other homes, looking in landscape supply yards, or browsing through Pinterest Boards like our garden edging ideas. 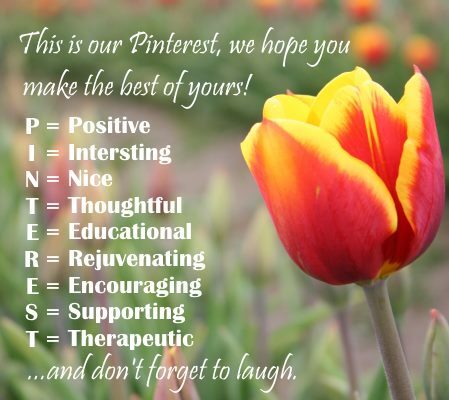 If you haven't seen our Pinterest boards yet, you should stop by for a visit. We have over 17,000 picture ideas categorized on over 90 different boards. You can join the nearly 200,000 other followers that find inspiration for their yards by clicking on the follow us link in the sidebar. With so many creative and inspiring landscape edging ideas out there, keep in mind what you see may look good, but might not frame your work in quite the same way as you see it. Edging is an important part of landscape design so we hope this brings a little more attention to one more key aspect of landscape designing. So remember to decide if you need it early in the game and don't leave it as an after thought. If you are looking for help installing your edging, you can visit our how to module on Installing edging and decorative rock.